This easy one-pot recipe isn't the same old chicken dinner. 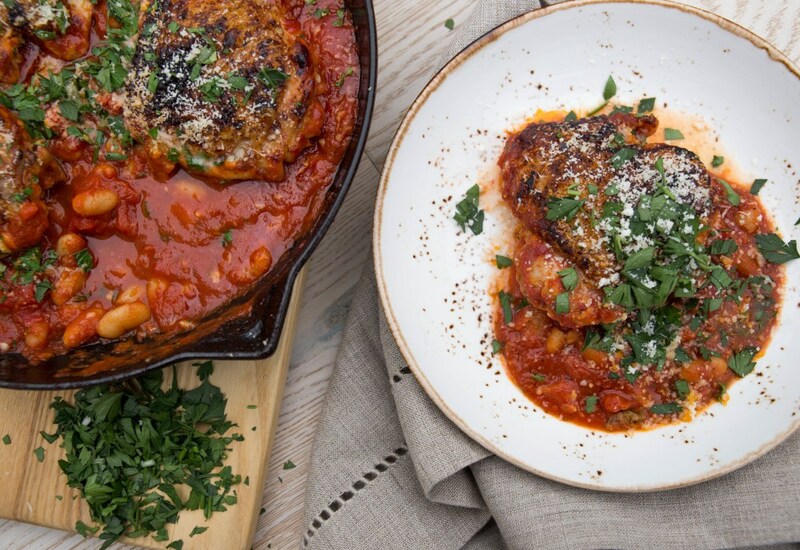 Juicy chicken thighs are seared until the skin is golden brown and crispy, then slowly braised in a comforting tomato and creamy cannellini bean sauce. Pan-searing the chicken thighs renders the fat and adds a ton of flavor to the sauce—be sure to not skip this step! It also makes for an addictive, crackly skin. Sprinkle the dish with fresh parsley and grated Parmesan cheese for freshness and a salty kick. Serve the chicken and beans with crusty bread to soak up the delicious, savory sauce! Chicken thighs are less expensive and have more flavor than breasts, but you can use bone-in, skin-on chicken breasts if you prefer white meat. Be sure to crisp the skin for maximum flavor! You can also try great northern or gigante beans instead of cannellini. Per Serving: 277 calories; 10g fat; 32.8g carbohydrates; 18g protein; 44mg cholesterol; 1218mg sodium. I'm just experimenting with chicken thighs, and used boneless to make it easier for my kids. Thighs are just so much more flavorful than breasts! The combo of savory tomato sauce with creamy white beans is a winner too - of course it requires a glass of red vino and some greens to round it out. Great comfort food this time of year. Really easy, tasty dinner with such easy cleanup. Will definitely make again. Opted for bone-in, skinless and just added a little more garlic and shallot for flavor. This was such little effort and a nice result for a weeknight meal! Plan to do it again next week. I love the simple seasonings (salt and pepper) used in this recipe. I used to always season meat with garlic powder and onion powder, but using real garlic and shallots and/or onions is much tastier. Anytime I can have dinner made in under an hour is a win for me. The white bean sauce was super delicious. I used navy beans though, I think they're pretty interchangeable and it what I had in my pantry. Also, I used boneless, skinless chicken breasts and still had great results.